10 Titles from the 1940s that give English and Social Studies classrooms an international flavor. The 1940s opened with the entry of the United States into World War II with the bombing of Pearl Harbor (1941) and ended with the establishment of NATO (1949). And he global perspective that resulted from these events had a real influence on the literature of the time. Throughout the decade, authors and playwrights from Great Britain and France were as popular as American authors and playwrights. Looking across the Atlantic, American readers sought answers about the origins of horrors unleashed in a Second World War: genocide, the atom bomb, and the rise of Communism. They found authors and playwrights who promoted existential philosophies ("The Stranger"), who anticipated dystopias ("1984"), or who offered a single voice ("Diary of Anne Frank") that affirmed humanity despite a decade of darkness. That same literature is taught in classrooms today to provide historical context to the events of the 1940s and connect the study of literature with history. Original cover "For Whom the Bell Tolls". Americans were so enthralled by the events in Europe during the 1940s that even one of America’s greatest writers, Ernest Hemingway, set one of his most famous novels in Spain during the Spanish Civil War. "For Whom the Bell Tolls" was published in 1940 and tells the story of American Robert Jordan, a who participates as a guerrilla against the fascist forces of Francisco Franco's in order to plan to blow up a bridge outside the city of Segovia. The story is semi-autobiographical, as Hemingway used his own experiences covering the Spanish Civil War as a reporter for North American Newspaper Alliance. The novel also features a love story of Jordan and María, a young Spanish woman who was brutalized at the hands of the Falangists (fascists). The story covers the adventures of Jordan over the course of four days where he works with others to dynamite a bridge. The novel ends with Jordan making a noble choice, to sacrifice himself so Maria and other Republican fighters can escape. "For Whom the Bell Tolls" gets its title from the John Donne poem, whose opening line—”No man is an island”—is also the novel’s epigraph. The poem and the book share themes of friendship, love, and the human condition. The reading level of the book (Lexile 840) is low enough for most readers, although the title is usually assigned to students taking Advanced Placement Literature. Other Hemingway titles such as the Old Man and the Sea are more popular in high schools, but this novel is one of the best recounts of the events of the Spanish Civil War which can help in a global studies course or 20th-century history course. "The Stranger" original book cover. Meursault, a French Algerian, attends his mother's funeral. A few days later, he kills an Arab man. As a result, Meursault is tried and sentenced to death. The first edition of the novel was not a major bestseller, but the novel became more popular over time as an example of existential thought, that there exists no higher meaning or order to human life. The novel has long been considered one of the most important novels of the 20th-century literature. 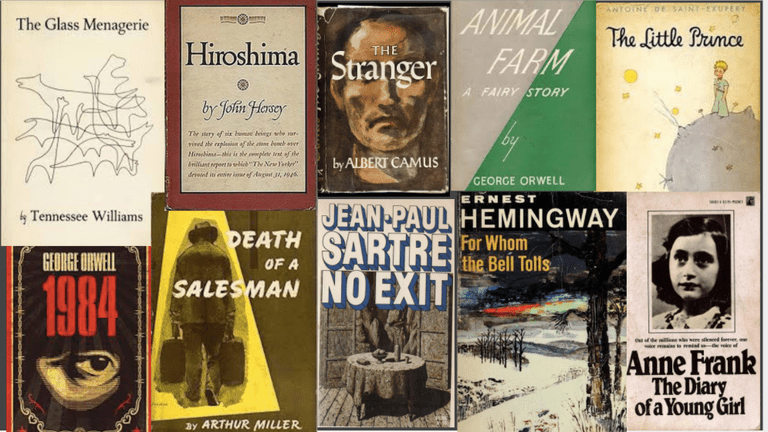 The novel is not a difficult read (Lexile 880), however, the themes are complex and generally meant for mature students or for classes that offer a context to existentialism. Original book cover for "The Little Prince". Amid all the terror and despair of World War II, came the tender story of Antoine de Saint-Exupéry’s novella The Little Prince. De Saint-Exupéry was an aristocrat, writer, poet, and pioneering aviator who drew on his experiences in the Sahara Desert to write a fairy tale that featured a pilot who encounters a young prince visiting Earth. The story's themes of loneliness, friendship, love, and loss make the book universally admired and appropriate for all ages. The book can be done as a read aloud as well as a book for students to read themselves. With year-to-date sales of over 140 million, there are sure to be a few copies that students can pick up! "No Exit" original book cover. The play "No Exit" is an existential work of literature from the French author Jean-Paul Sartre. The play opens with three characters waiting in a mysterious room. What they grow to understand is that they are deceased and that the room is Hell. Their punishment is being locked together for eternity, a riff on Sartre's idea that "Hell is other people." The structure of No Exit allowed Satre to explore existentialist themes he proposed in his work Being and Nothingness. The drama themes are generally meant for mature students or for classes that may offer a context to the philosophy of existentialism. Students may even notice a comparison to the NBC comedy The Good Place (Kristin Bell; Ted Danson) where different philosophies, including Sartre’s, are explored in the “Bad Place” (or Hell). Original book cover for "The Glass Menagerie". "​The Glass Menagerie" is an autobiographical memory play by Tennessee Williams, featuring Williams as himself (Tom). Other characters include his demanding mother (Amanda), and his fragile sister Rose. The play premiered in Chicago and moved to Broadway where it won the New York Drama Critics Circle Award in 1945. In examining the conflict between one’s obligations and one’s real desires, Williams recognizes the necessity of abandoning one or the other. With mature themes and a high Lexile level (L 1350), "The Glass Menagerie" can be made more understandable if the production is available to watch such as the 1973 Anthony Hardy (director) version starring Katherine Hepburn or the 1987 Paul Newman (director) version starring Joanne Woodward. "Animal Farm" original book cover. Finding satire in a student’s diet of entertainment is not difficult. Their social media feeds are crammed with Facebook memes, Youtube parodies, and Twitter hashtags that come out as fast as the news cycle breaks a story. Finding satire in literature can be just as easy, especially if George Orwell’s "Animal Farm" is in the curriculum. Written during August 1945, "Animal Farm" is an allegorical story about the rise of Stalin after the Russian Revolution. Orwell was critical of the Stalin’s brutal dictatorship, one that was built on a cult of personality. The direct comparison of the animals of Manor Farm in England to political figures in history served Orwell’s purpose to "to fuse political purpose and artistic purpose into one whole.” For example, the character of Old Major is Lenin; the character of Napoleon is Stalin; the character of Snowball is Trotsky. Even the puppies in the novel have counterparts, the KGB secret police. Orwell wrote "Animal Farm" when the United Kingdom entered into an alliance with the Soviet Union. Orwell felt Stalin was far more dangerous than the British government understood, and as a result, the book was initially rejected by a number of British and American publishers. The satire only became recognized as a literary masterpiece when the wartime alliance gave way to the Cold War. The book is number 31 on the Modern Library List of Best 20th-Century Novels, and the reading level is acceptable (1170 Lexile) for high school students. A live action film 1987 by director John Stephenson can be used in class, as well as listening to a recording of The Internationale, a Marxist anthem that is the basis for the novel’s anthem "Beasts of England." Original cover design for John Hershey's "Hiroshima". If educators are looking to connect history with the power of storytelling, then the best example of that connection is John Hershey’s "Hiroshima." Hershey blended fiction writing techniques to his nonfiction recount of the events of six survivors after the atomic bomb destroyed Hiroshima. The individual stories were originally published as the only article in the August 31, 1946, edition of The New Yorker magazine. Two months later, the article was printed as a book that has remained in print. The New Yorker essayist Roger Angell noted that the book’s popularity was because "[i]ts story became a part of our ceaseless thinking about world wars and nuclear holocaust". Such details help to make an event in a history textbook more real. Students may or may not be aware of the proliferation of nuclear weapons around the globe with armed states, and teachers can share the list: United States, Russia, United Kingdom, France, China, India, Pakistan, North Korea, and Israel (undeclared). Hershey’s story can help to make students aware of the impact of so many weapons could have anywhere on the globe. Original book cover "The Diary of Anne Frank". One of the best ways to connect students to the Holocaust is to have them read the words of someone that could be their peer. The Diary of a Young Girl was written by Anne Frank as she was in hiding for two years with her family during the Nazi occupation of the Netherlands. She was captured in 1944 and sent to Bergen-Belsen concentration camp where she died of typhoid. Her diary was found and given to her father Otto Frank, the family's only known survivor. It was first published in 1947 and translated into English in 1952. “It takes a real writer to hide the mechanics of her work and make it sound as if she is simply talking to her readers." 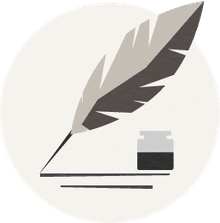 There are multiple lesson plans for teaching Anne Frank including one centered on the 2010 PBS Masterpiece Classic series The Diary of Anne Frank and one from Scholastic titled We Remember Anne Frank. There are also numerous resources for educators in all disciplines offered by the Holocaust Museum that feature thousands of other voices from the Holocaust that can be used to complement a study of Anne Frank’s diary. The diary (Lexile 1020) is used in middle and high schools. Original book cover for "Death of a Salesman". In this unsettling work, American author Arthur Miller confronts the concept of the American dream as an empty promise. The play received the 1949 Pulitzer Prize for Drama and Tony Award for Best Play and is considered to be one of the greatest plays of the 20th century. The play’s action takes place in a single day and a single setting: protagonist Willie Loman's home in Brooklyn. Miller employs flashbacks that replay the events leading up to the fall of a tragic hero. Original book cover for "1984". The authoritarian regimes of Europe were the target of George Orwell's dystopian novel published in 1949. "Nineteen Eighty-Four" (1984) is set in a future Great Britain (Airstrip One) that has become a police state and criminalized independent thoughtcrimes. Control of the public is maintained using language (Newspeak) and propaganda. Orwell’s protagonist Winston Smith works for the totalitarian state and rewrites the records and retouches photographs in order to support the state's shifting versions of history itself. Disillusioned, he finds himself seeking evidence that could challenge the will of the state. In this search, he meets Julia, a member of the resistance. He and Julia are tricked, and the brutal tactics of the police force them to betray each other. The novel received a great deal of attention over thirty years ago, in the year 1984, when readers wanted to determine Orwell’s success in predicting the future. The book had another surge in popularity in 2013 when the news about National Security Agency surveillance was leaked by Edward Snowden. After Donald Trump’s inauguration in January of 2017, sales spiked again with the focus on the use of language as a controlling influence, just as newspeak is used in the novel. The novel is generally assigned to complement social studies units dedicated to global studies or world history. The reading level (1090 L) is acceptable for middle and high school students.